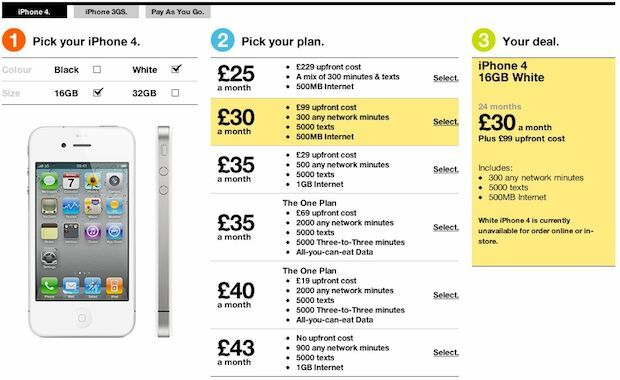 The White iPhone 4 has appeared for sale on UK cell provider Three’s website, with a delivery date of Wednesday, April 20. While the release date isn’t surprising considering the white iPhone is supposed to be available by the end of April, what is surprising is the 16GB model is nowhere to be found, suggesting the phone may only come in 32GB sizes. Update: Scratch the 32GB only thing, we eventually found a 16GB model on Three UK’s site, their site search is just awful (a search for iPhone turns up several Nokia phones, for example). Screenshot at the bottom of the post. I’m still wondering if anyone cares about a white iPhone when there is continuous talk about a iPhone 5, due out sometime in the next 6 months, that would probably come in white and black too. Has anyone really held out for over a year waiting to upgrade to an iPhone 4 just so they can get a white model? I find that unlikely, although maybe the white iPhone will get a sales boost if it can glow like the white iPad 2. Anyway, if you’re in the UK and have been dying for the unicorn phone, try to place an order on Three’s website since you can add the phone to a shopping cart. There’s always a chance Three has made a mistake on the availability and shipping date, as MacGasm points out it could just be a PR blunder. I got excited briefly here hoping the 16GB model died off. It would be great if the models were 32GB and 64GB for the same price, otherwise what’s the incentive to buy a year old phone? My 3GS will last me until a more significant update, I want feature updates not a new color. I’m really quite disinterested in color changes, not sure what the theory is behind this. One year later and you can buy a new color, whoopy? The Tech news media is all abuzz over aging technology just because we can finally(!) get it in a white wrapper? Fine, choice is nice, but to trumpet this up as the second coming ? … I don’t get it. Who cares?